Manchester University offers an environment where students can grow, lead and make a real difference. This spring, the University celebrates two seniors who have shown exceptional leadership. 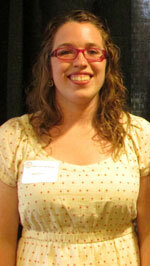 Kyla Daniels of Indianapolis is the Capstone Outstanding Senior Leadership Award winner. The award recognizes a student who has contributed significantly to the quality of campus life throughout their years at the University. She has been a student leader in the Center for Service Opportunities, where she organized service projects and volunteer placements for the campus community. She also served on the Conduct Review Board and the Academic Integrity Board. She volunteered with the Indiana Reading Corps and at the Community Dinners in North Manchester, and organized the Claypool Elementary Afterschool Program. She modeled MU’s commitment to diversity, inclusion and community by completing Safe Zone training, Hate Crime training and Mental Health First Aid training (a certification course for which Daniels was the primary organizer). She also served as president of the Social Service Club. She recently completed her term as the student representative on the Mental Health America of Wabash County Board of Directors. Daniels also sought out an impressive number of field experiences and internships while at Manchester, including being named a Journey Fellow, completing practicums at Vernon Manor Children’s Home and Community Harvest Food Bank of Northeast Indiana. She also interned at Wheeler Mission in Indianapolis, one of the largest providers of services to homeless people in the state, and is currently completing a 420-hour senior social work field placement at the state headquarters of the National Association of Social Workers-Indiana Chapter, monitoring and advocating for socially just state laws to improve the well-being of the most vulnerable Hoosiers. Daniels is completing a double major — social work and political science – and scheduled to graduate May 17. 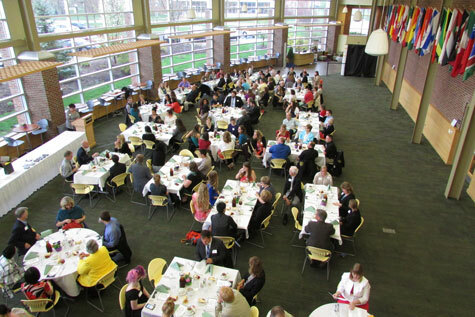 The following seniors were also nominated for the Capstone award: Peter Bauson, Jessica Bostic, Andrew Burgess, Nicola Jones, Dylan Murphy, Selamawit Nicolai, Kara Olson, Jaclyn Stiffler and Brooke Danielle Walker. 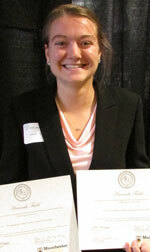 Hannah Field of Fort Wayne is the Outstanding Student Leader of the Year at Manchester. The award recognizes Field for distinguishing herself as an outstanding leader, contributing significantly to the quality of campus activities and/or services throughout the 2014-2015 school year. T his included going out into the heavy snows in North Manchester this past winter and shoveling one driveway by herself, then the neighbor’s, then more ­– motivating others to follow suit. A senior who is graduating in 2016, Field has worked as a student financial assistant in the Office of Financial Services, as a writing assistant for the Accounting and Business Club, as an accounting tutor for the Success Center and as an intramural official for volleyball, basketball and soccer. She also served as president of the Fellowship of Christian Athletes club, treasurer of the Accounting and Business Club and as a member of the Manchester Activities Council. The following students were also nominated by their peers: Lucas Al-Zoughbi, Kari Cottingim, Kayla Daniels, Nicola Jones, Rissa Loc, Dylan Murphy and Selamawit Nicolai.